When we first saw the large billboard along EDSA announcing the arrival of Quiznos in the country, my sister cheered in excitement. 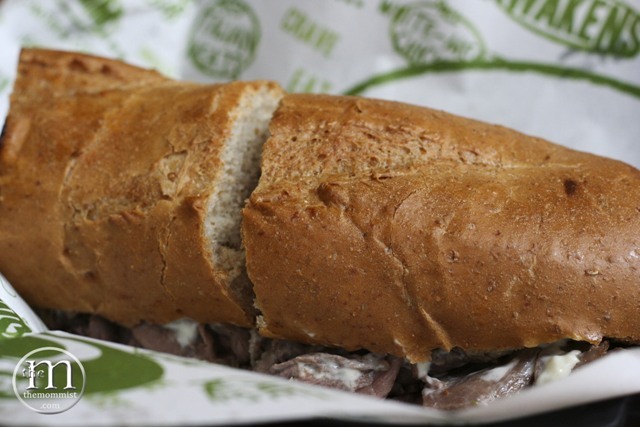 Between the two of us, it is really she who is the bigger fan of the sandwich chain. I think, she's the number one fan of those toasty subs...in the world. It was stated on the billboard that the shop will open Summer of 2012. When summer ended, there was still no word as to when the opening will be. 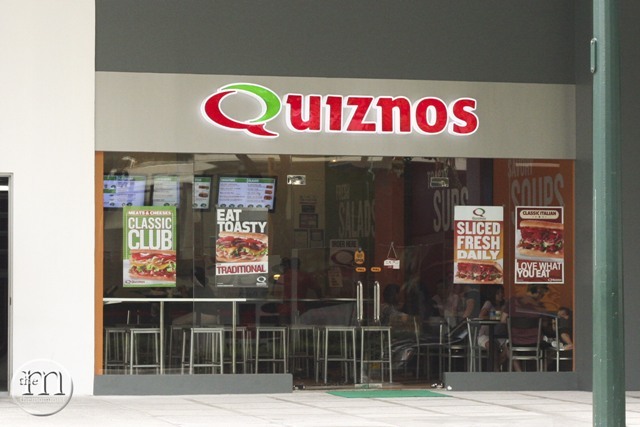 My sister (who has the patience of a fetus), kept asking me when the first Quiznos restaurant will open. How would I know?! 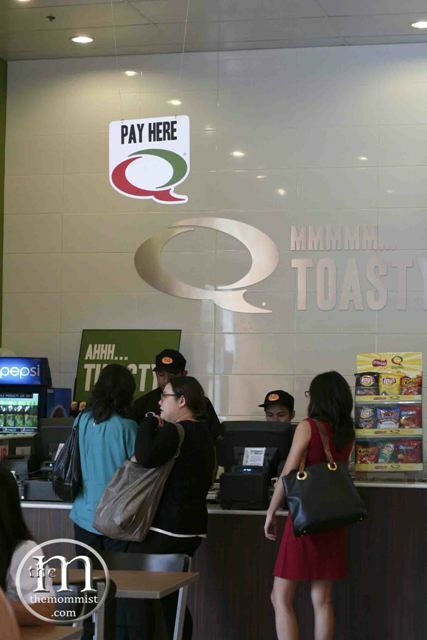 Anyway, Quiznos has finally opened their first shop and my sister can now gobble up on all the Qrave-worthy subs to her tummy's content. 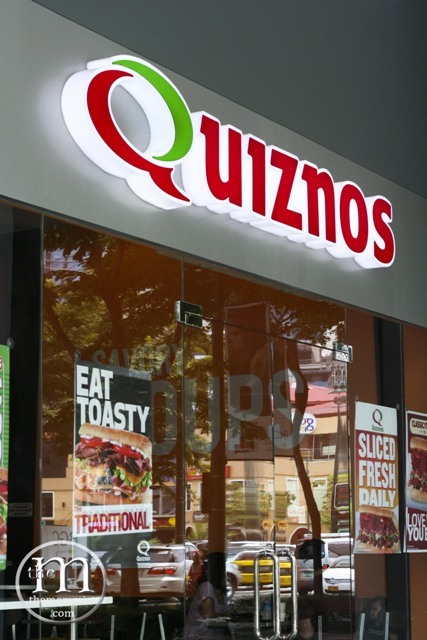 Many are probably wondering if Quiznos is better than Subway - since the latter is well-known in our country. It is better than Subway! Their breads are better, they don't scrimp on meat (you don't have to search for the meat underneath a pile of veggies), and their dressings and condiments are tastier. We're pleased to see that the Filipino comfort food Adobo (Adobo Pulled Pork) is included in the menu. 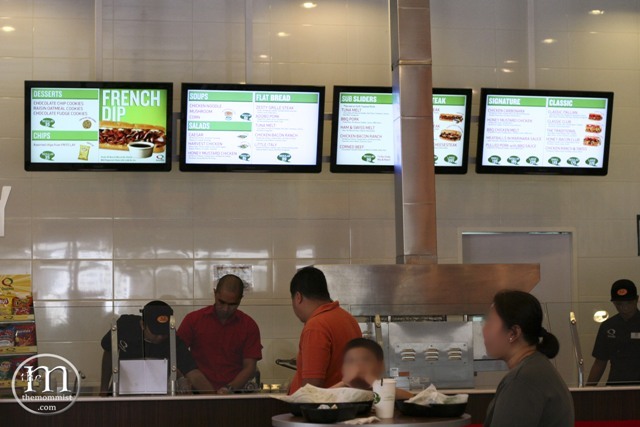 We like it when an international chain "localizes" their menu by including home-grown favorites. Quiznos is a self-service sub shop. For those who are not yet aware of how ordering is done, here'a a rundown. For those who are already experts, you can, of course, skip this part. No. 1: For Here of To-Go? I don't think I need to elaborate much on this because it is self-explanatory. 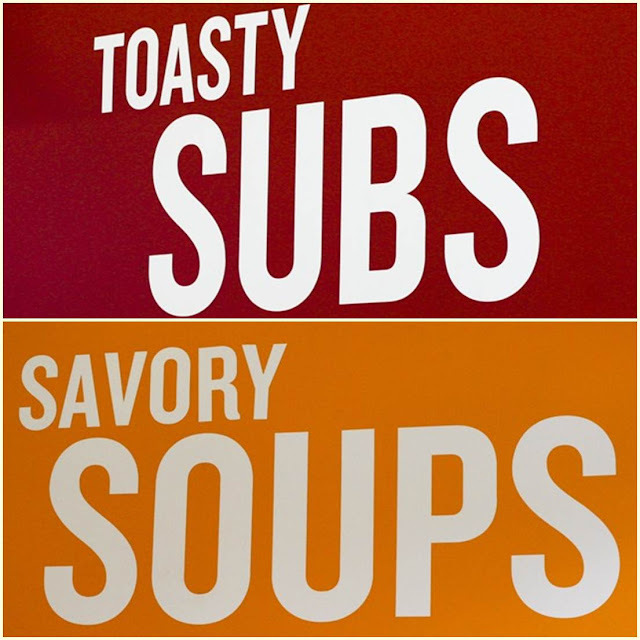 Choose which sub you like then tell them which size you want. They have three sizes - 5" (small), 8" (regular), and 11"(large). They have Italian White, Artisan Wheat, Rosemary Parmesan. 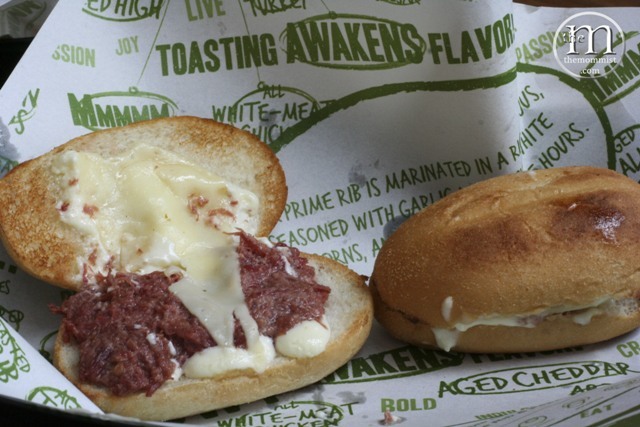 For us, the Rosemary Parmesan is the best followed by the Artisan Wheat. 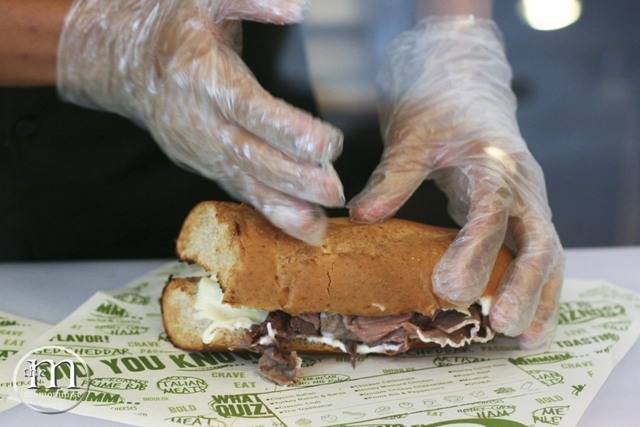 You can now watch as your sub is being prepared. More mozzarella, please. No, more. More! Thank you! Perfectly toasted sub straight out of the toaster! Come to my belleh! No. 3: Choose your drinks. No. 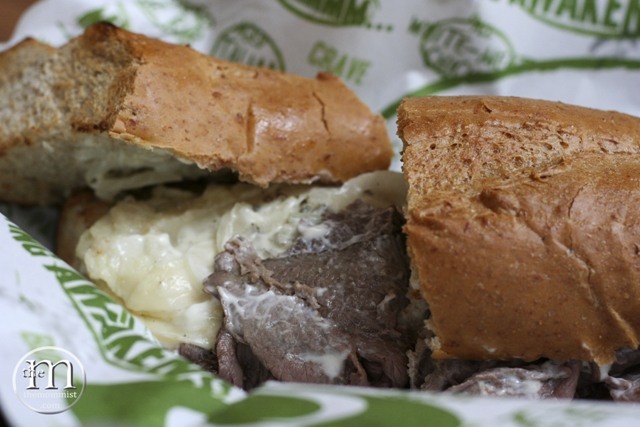 5: Enjoy Your Subs! 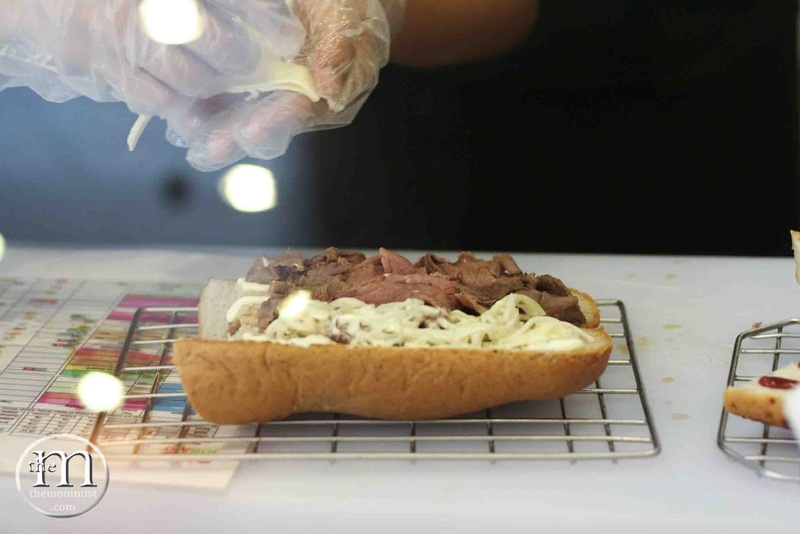 Thinly sliced steaks (tender and juicy) are topped with sautéed onions, mayonnaise, and double all-natural Swiss! 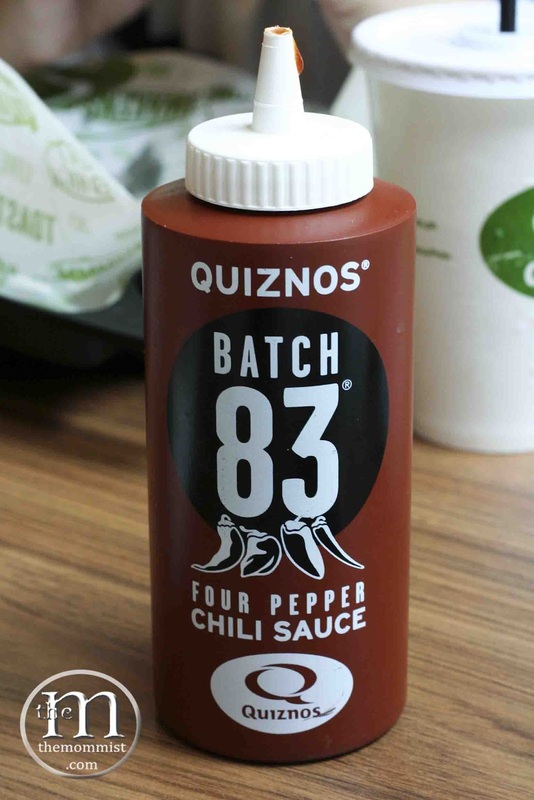 I asked for additional slices of mozzarella and squirted a lot of Four Pepper Chili Sauce in my sandwich for that extra tang! Mmmmmm...delicious!!! 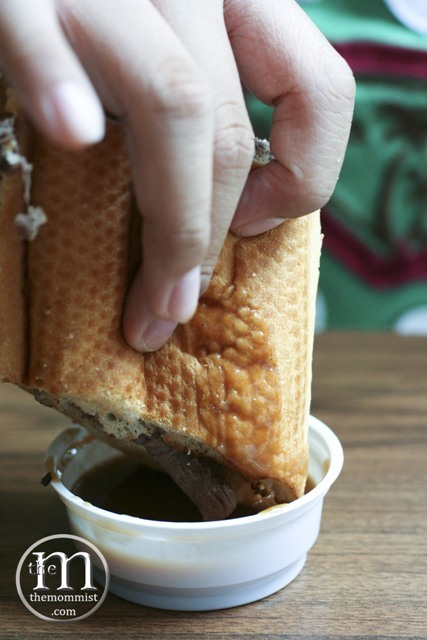 This is my sister's favorite, The French Dip (melted mozarella, tender steak, sautéed onions, mild peppercorn sauce with a side Au Jus). Lean flavorful meat and a really good sauce! Dip it like so. That's J6's (eldest son) hand. He let out a sigh of annoyance while I was taking multiple shots of this. The kid was starving! 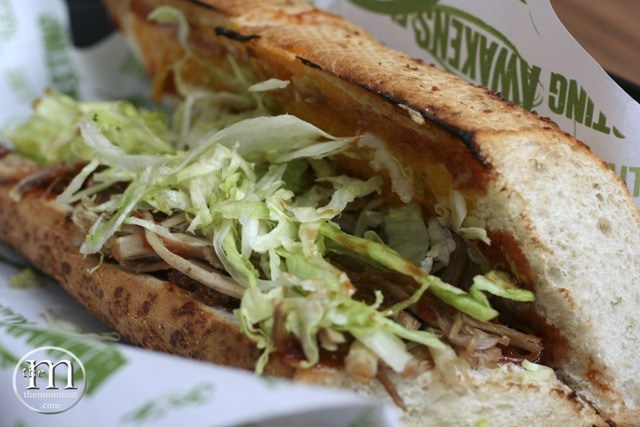 Lightly toasted soft roll that encases a bevy full of shredded pulled-pork, cheddar, bbq sauce, and thinly chopped lettuce! This BBQ Pork is a winner! Our youngest chose the sub-slider, Corned Beef. 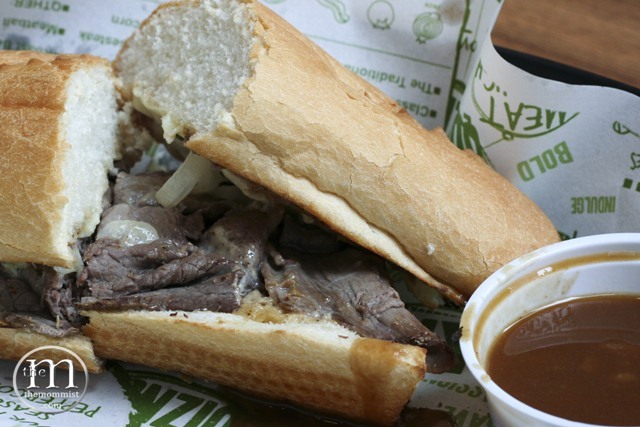 The all-too-familiar taste of the famous beef is made extra special with the addition of cheddar cheese, sauteed onions, and garlic aioli. This makes a lot of difference in a sub! 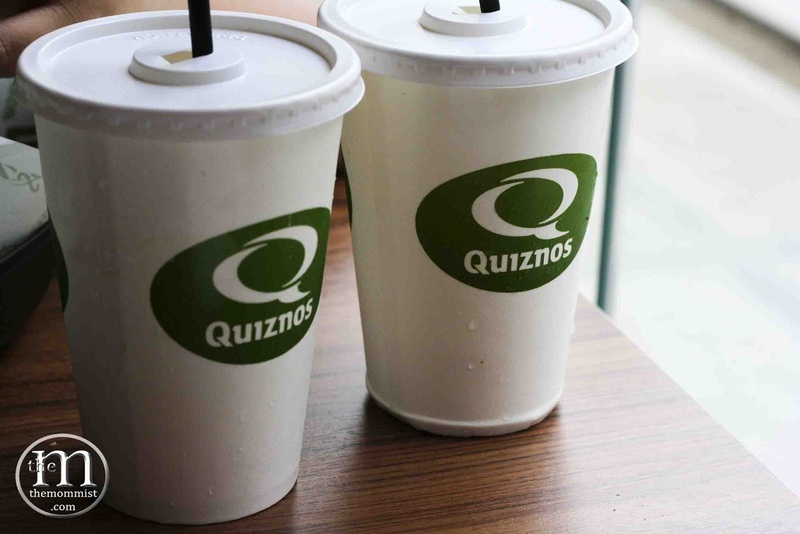 Quiznos is a standout but we're docking a point for a gripe. 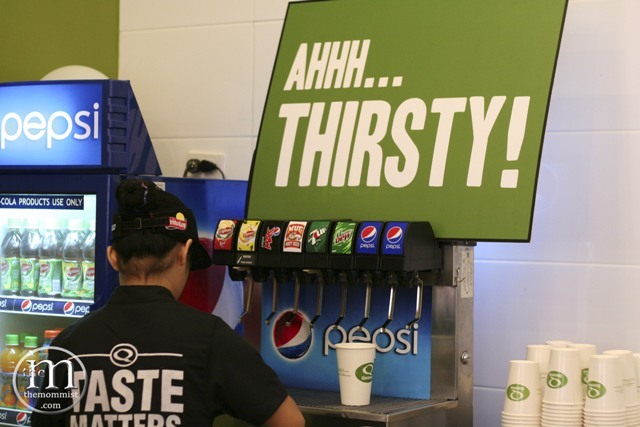 Being the sub-shop that it is, we think that a sink should be readily available to the customers. They don't have one. They do have an anti-bacterial gel but that is for before the meal. Other than that, we think that they're doing a mighty fine job. Great food, good service, and parking is plentiful. 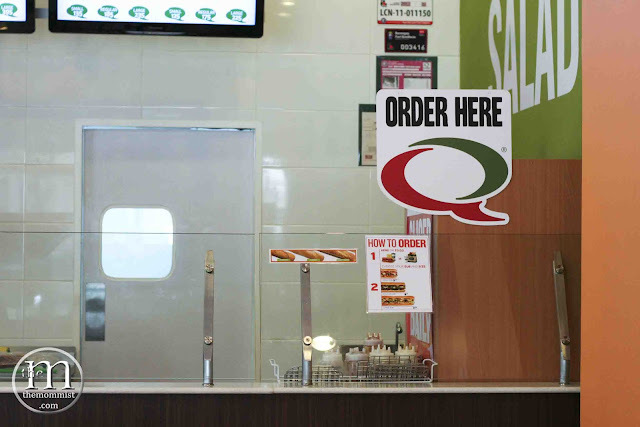 It took quite a bit of time before they opened their first store, but, Quiznos is well-worth the anticipation.